Burma Burma is a paradise for foodies, especially for the ones who love authentic Burmese cuisine. Right from appetizers like Crunchy Tofu Steamed Buns to salads like Tayat Ti Thoke, their epic dishes hit all the right spots. If you’re a sucker for all things sweet (just like us), then make a note of their new desserts which have been curated by the famous pastry chef Vinesh Jhonny. Here’s our list of 4 dishes that we think are perfect for ending your meal on a sweet note. This delicacy hits home, especially if you want you’re in it for the authentic Burmese experience. The combination of house-baked milk along with vanilla whipped ganache, raspberry gel, fried brioche and almond nougatine was delightful and satisfying with every bite. But what really stole the show was the addition of velvety saffron pistachio cream to the mix. Buttery, flaky paratha with warm apple crumble and vanilla cinnamon cake topped off with freshly whipped ganache and salted caramel sauce makes for one delish winter delight. 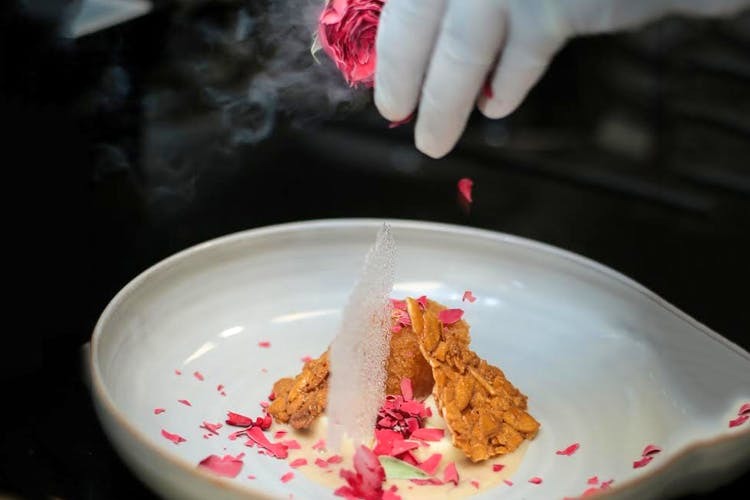 It comes with some vanilla ice cream and crunchy apple crisps which just keeps adding on to the burst of flavours with every bite. Forbidden? Far from it actually. Think dark cherries oozing out rich dark chocolate Bavarian cream with every bite. Add to the mix a dash of cherry confit, dark chocolate yogurt cake and cherry bonbon and you’ve got yourself the perfect post-meal dark chocolate indulgence. Get prepped for deliciousness in the form of black sesame cakes and jaggery cinder toffee on coconut ganache along with coconut cream rocks served with tapioca jaggery pearls, coconut custard, and passion fruit gel. Burma Burma has taken over our taste buds and we are not complaining. It’s the kinda place where you can try out new dishes each time with the promise of never being disappointed. Head over and get ready to be served with a round of perfection for your palate.